Bluet & Clover: Birthday Blowout! 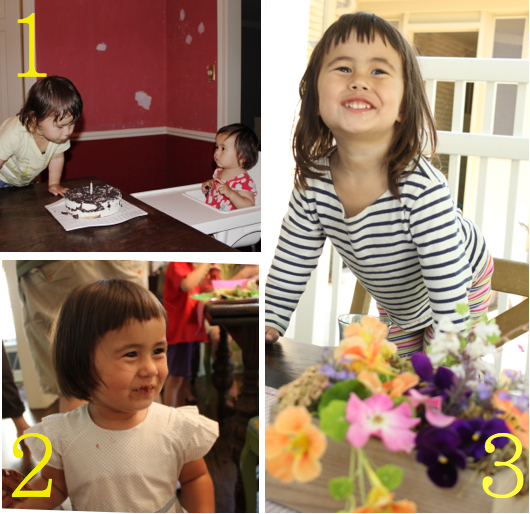 There was some celebrating going on at our house recently when Isla turned 3. Where does the time go? We realized that she's had all three of her birthdays in this house, unlike her big sis who's had half in Tokyo and half here. Of course, I took lots of pictures of our birthday girl, but I also wanted to think of a way we could remember her special day besides just framing a picture. 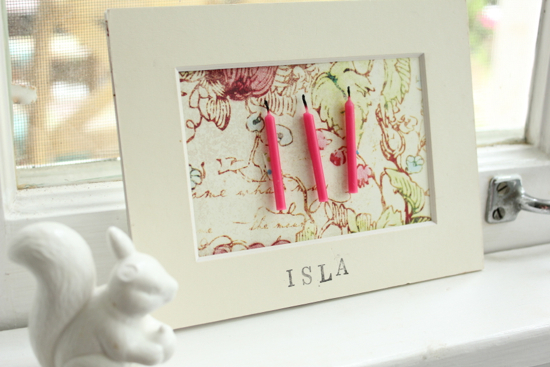 I thought it would be cute to glue her cupcake candles to some pretty paper and frame it. That's not a real frame, just a mattboard that has a hook on the back. 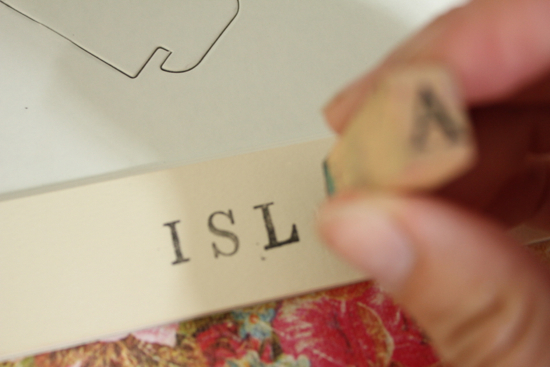 A shadow box would look really cute too, but I'm working with what I've got today. It's nap time, so I'll have to get out the hammer later today and add it to that wall I've been working on. I stamped the birthday girl's name right onto the mattboard and used a glue gun to stick the candles to some pretty paper (after cutting the paper to size and sliding it between the mattboard). Oh and I washed the icing off the candles first, because bugs aren't so cute. I'm thinking we can slide in new paper and candles for each birthday. That way we won't run out of wall space by making a new frame every year. Or how cute would it be to start with your kid's first birthday candle and glue a new one each year. Man, I wish I'd thought of that sooner. 3 years, 3 birthdays. Look at those red walls in the dining room! I was in the middle of stripping the wallpaper and not exactly ready for entertaining, but maybe I should have bought some balloons or something. I think I'm improving on the birthday decorating thing though.